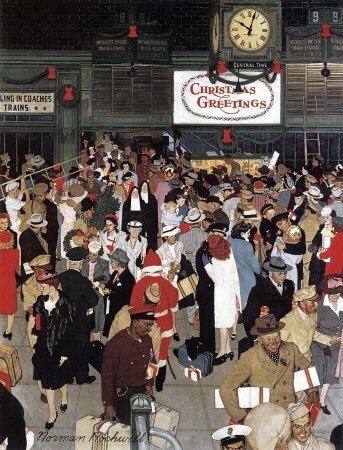 This Norman Rockwell Christmas painting, Union Station Chicago, appeared on the cover of The Saturday Evening Post published December 23, 1944. This remains a timeless favorite of all Rockwell collectors, no matter what their age. An alternate title for this painting is Train Station at Christmas. The original oil on canvas, 32 x 25 inches or 81 x 63.5 cm, is housed in a private collection. This Norman Rockwell Christmas painting was the 226th overall out of 322 total published Norman Rockwell Saturday Evening Post cover. Rockwell's career with the Post spanned 47 years, from his first cover illustration, Boy With Baby Carriage in 1916 to his last, Portrait of John F. Kennedy, in 1963. This was also the ninth Rockwell Post cover illustration of 1944.
on page 159 of Norman Rockwell, A Definitive Catalogue by Laurie Norton Moffatt. This Christmas picture continued The Post's long tradition of presenting a Norman Rockwell Christmas painting on its cover. I have seen mint copies of this cover sell for close to $100. And to think it only cost ten cents when brand new! Here Rockwell gives a glimpse into a moment in time at Union Station during the hustle and bustle of Christmas. My, what a swarming sea of humanity! Unlike most swarming seas, though, these folks are at their best. It is the holidays, after all. The first thing I notice about these people is that most all of them are smiling. The gentleman in the right foreground really shows us a broad smile. Many of them are there to meet and pick up incoming firends, relatives and loved ones. I see three American servicemen being welcomed home to Chicago by their sweethearst. Those are the only ones locked in an embrace at the moment. Several more may have just finished their initial embrace. By the time he painted this picture, Rockwell was firmly entrenched in using photographs instead of having models pose for hours on end. That's a good thing, too. There is very little possibility that even an artist as talented and organized as Rockwell could have produced a painting this detailed with live models or from memory. Union Station Chicago was only one of 322 Norman Rockwell Saturday Evening Post covers; Here is the list of Norman Rockwell Saturday Evening Post cover illustrations. As for the models for the painting, it is my understanding that Rockwell and his photographer captured the moment at the train station. No doubt, Rockwell enhanced the story and moved people around for composition. Other than that, this is a snapshot of that moment. Just in case the "Christmas Greetings" sign was not enough of a clue about the season, Rockwell included a Christmas icon in the painting. Santa is even at the station to meet someone. I don't see Mrs. Claus anywhere; she must still be on the train.